Welcome back!! Wow!! Has it been 2 weeks since my last post?? Time has sure flown and I can't believe that we are already over half way through March. I have been really busy with our house having a little flood problem.....some of it did get into my scrapping room =( ......and preparing for my daughters birthday party. I have also been working on some design team projects (as well as a surprise I get to share with you tomorrow), so there is a lot to share with you in the coming days. I had to sit down in the middle of all the things that have been going on and create this card based on Kazan's Sketch 48 at 2 Sketches 4 You. I had a Stampin' Up! party a couple of weeks ago, so I created this card with some of my new Stampin' Up! goodies. Check back tomorrow for some exciting news and to see what I have created for the new Caardvarks challenge. I love this card! It is beautiful and very bright and cheery! Thanks for sharing your creativity! Especially when things can get hectic in life! Ha! I tried to comment a bit ago and it wouldn't keep the message. Funny that you commented on my blog about the same thing, LOL! I also said your card is cute and that floods stink and I hope things are ok! Love it -- the colors are so fresh and fun. Hope that flood isn't making life too crazy and that I get to see you soon! 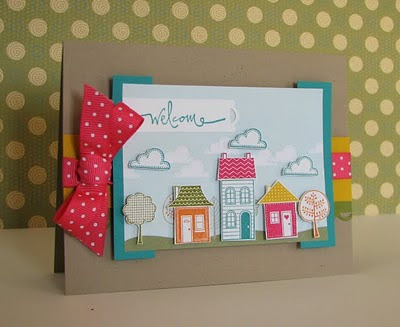 i LOVE this card :D great new goodies... i love playing with new things. Cuter than cute!! LOOOOOVE this sososoooooo much!! !